"Dedicated to the memory of a great hero." Sony Classical continues to release the Beethoven symphonies, featuring the Berlin Philharmonic Orchestra conducted by Herbert von Karajan, on DVD. This second installment to be released gives us symphonies nr. 2 in D, op. 36, and nr. 3 (the "Eroica") in E﷓flat, op. 55. The third symphony was to be dedicated to Napoleon, whom Beethoven idolized as a revolutionary. The dedication was angrily scratched out when Beethoven learned that Napoleon had declared himself emperor (the original score has a hole where Beethoven's pen has completely eradicated both the name "Buonaparte" and the paper it was on). I do have some problems with the performance of the Eroica; the first movement, which should be truly revolutionary, doesn't come across in that manner. The strings can't seem to go beneath a mezzoforte, even where 'piano' is indicated (and in the second movement, 'sotto voce'). They do fine in the 3rd and 4th movements, though. This leads me to think that this is a decision by von Karajan that (to my mind) just doesn't work. The first movement of the Eroica is supposed to be Allegro con Brio but there is far more 'con Brio' in the first movement of the Second Symphony on this disk. The performance of the Second Symphony ranks among the very best I've heard, full of vitality and spark. I would give the Second Symphony a very solid A; the Eroica merits about a B+ and the style grade given is the average of the two. Image Transfer Review: The picture is muted in color, as was the case with the DVD of Ninth Symphony in this series. The color palette is intentionally limited. This disc, also like the Ninth, features nice overlays of various instruments as they are given prominence in the score. The camera moves frequently and the picture tends to be clear though a little soft in places. Audio Transfer Review: The PCM stereo sound is good but unexceptional. The 4.0 mix was very aggressive in the bass, with little or no directionality to be heard. It took a while to get used to the 4.0 mix, which is so different from other recordings of these symphonies, but I found that I much preferred it. As an example, the ascending notes of the celli and basses in the climax of the Finale to Symphony nr. 2 are nothing special in the PCM mix, but in the DD mix are given a prominence which makes them all the more driving and compelling. Be sure that you have main speakers which are capable of good bass response when listening to this track. The problems in the mix of the Ninth Symphony (where the timpani drowned out the other instruments) are corrected here; the timpani are prominent but not improperly so. 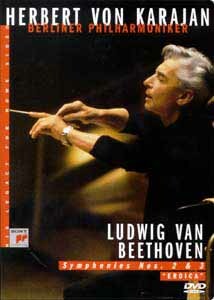 Extras Review: The sole extras are the biography of von Karajan and brief notes on the symphonies themselves. These are presented in English, German and French. The chaptering could have been more generous; for instance, I would have liked to have access to the Allegro con brio of the first movement of the Second Symphony without having to go through the Adagio molto introduction. In all, the Second symphony is excellent, but the first two movements of the Eroica are a little disappointing. If you think of classical music as having insufficient bass, these recordings will set you straight on that count. Recommended.